In the Night Garden Catch Up? In a magical forest, colourful characters have adventures and are read stories. The Pontipines take their dinner aboard the Ninky Nonk. Children's programme. Igglepiggle and Upsy Daisy wave to each other from their carriages on the Ninky Nonk. Series 1 - What Loud Music, Tombliboos! Children's programme. 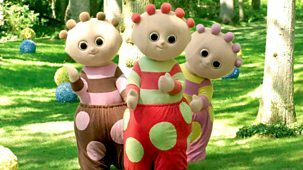 The Tombliboos play music very loudly, and Makka Pakka has to use his trumpet through Upsy Daisy's megaphone to be heard. The Pontipines play hide-and-seek with the Wottingers. But the Pontipine children keep changing their hiding places until they all end up in Upsy Daisy's bed. Children's programme. Upsy Daisy has trouble making her mind up about what she wants to do. In a magical forest, characters have adventures. The Pontipines are eating their dinner when Mr Pontipine's moustache flies off. Series set in a magical forest. The Tombliboos ride the Ninky Nonk. 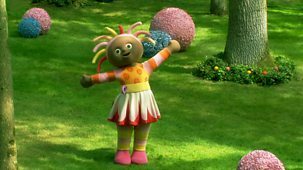 It goes past Igglepiggle, Upsy Daisy and Makka Pakka, and everybody tries to catch it. Series for young children set in a magical forest. The Tombliboos play inside with the ball until it flies out the window. Series for young children. 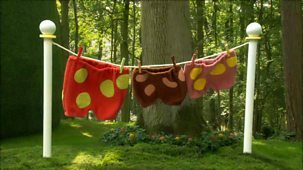 On a very windy day, Igglepiggle's blanket is blown into the air and the Tombliboos' trousers are blown off the line. Series 1 - Where Are The Wottingers? The Pontipines go to meet the Wottingers. The Wottingers are not in. Where could they be? The Pontipines go looking for them around the garden. Children's programme. 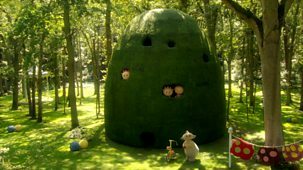 Everybody runs about in the garden so much that Makka Pakka can't wash faces. After a lot of chasing, Makka Pakka finally gets to wash everyone. In a magical forest, colourful characters have adventures. Upsy Daisy teaches Igglepiggle how to kick the ball, and Igglepiggle kicks the ball around the garden. In a magical forest, colourful characters have adventures. The Tombliboos' trousers get mixed up all over - in the Ninky Nonk, in the Pinky Ponk. Series for young children. Upsy Daisy shows her love for everything in the garden by dancing. The Pinky Ponk imitates her every move. In a magical forest, colourful characters have adventures. The Pontipines ride on the Ninky Nonk but Mr and Mrs Pontipine can't find the children. Series 1 - Be Careful Tombliboos! Travelling in the Pinky Ponk, the Tombliboos drink their Pinky Ponk juice, managing to narrowly miss spilling their drinks, but finally it splats everywhere. Series 1 - Shshsh! Upsy Daisy's Having A Rest! Upsy Daisy wants to rest in bed but keeps being disturbed. Finally she is left alone but finds she would rather play with her friends after all. 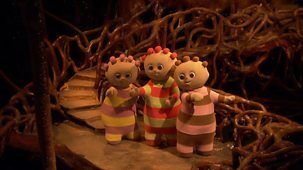 Series 1 - Where's Your Uff-uff Makka Pakka? Children's programme. Makka Pakka is washing the ball when his Uff-uff blows away. Upsy Daisy sets off through the garden to return it. Igglepiggle visits everyone in the garden, but he cannot find the Pontipines because they are so very small. Where can they be? Makka Pakka makes a pile of six stones. He gives everyone in the garden a stone for a present and is left with one, a special stone for Makka Pakka. 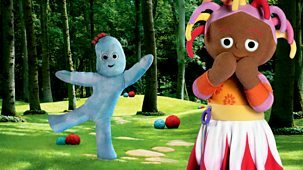 Igglepiggle and Upsy Daisy go on a long walk. Feeling tired, they decide to return by Ninky Nonk - and have a very bouncy ride. Series for pre-school children. Everyone is riding on the Pinky Ponk when the ding dong alarm goes. The Pinky Ponk goes up, up and over and down, down and under. Children's series. Makka Pakka washes the smallest Pontipines' and the biggest Haahoos' faces. 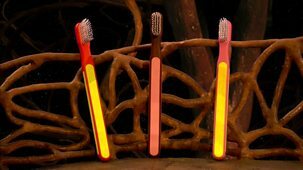 The Tombliboos have fun cleaning their teeth. Children's series set in a magical garden. 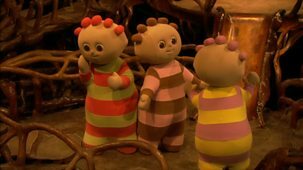 The Tombliboos are in their house when Makka Pakka calls. In their haste to leave, Tombliboo Eee goes the wrong way. Pre-school series set in a magical garden. 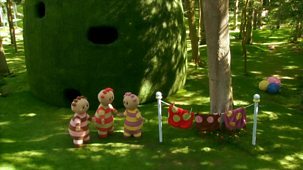 Makka Pakka discovers he can make musical notes by tapping different stones. Series for young children. Upsy Daisy loves the garden so much that she kisses everything around her. When she kisses things, magic starts to happen. Children's show. 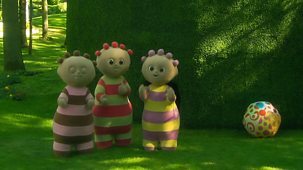 Igglepiggle discovers the stones which Makka Pakka has carefully tidied into a special pattern, but then he accidentally knocks them over. In a magical forest, characters have adventures. Igglepiggle is dancing in the garden when his blanket falls on top of the Pontipine house. Children's programme. Everyone goes for a ride on the Ninky Nonk but the Pontipines are left behind, so they chase after it all around the garden. 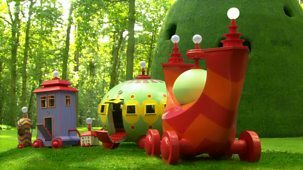 Children's show about a magic garden. The Tombliboos ride on the Pinky Ponk, explore the garden and see interesting things before returning home. Children's programme. Everyone enjoys a ride on the Pinky Ponk, but Ooo is more interested in drinking Pinky Ponk juice. Series for young children. The Pontipines set out on their long walk, but everywhere they go their neighbours, the Wottingers, are there before them. Children's series. 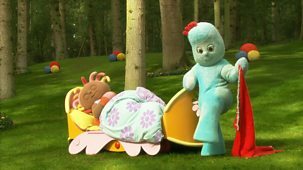 Igglepiggle cannot find Upsy Daisy, but he spots her bed. Upsy Daisy's bed always knows where she is. Series 1 - Where Is The Pinky Ponk Going? Series for young children. 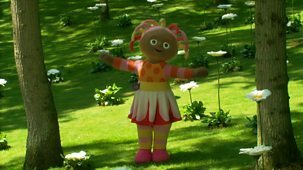 Everyone in the Night Garden boards the Pinky Ponk for a special journey to see a magical flower. The ball bounces around the garden visiting one character after another. They all enjoy playing with it until it reaches Makka Pakka and his uff-uff blows it right away. Series for young children about a magical place. Upsy Daisy sings through her megaphone. The Pontipines cover their ears - what loud singing! Series for young children. The Pontipines go for a long walk. Their children play a game of jumping in the Tombliboos' trousers. Series for young children. Upsy Daisy sets up her own special megaphone to sing but she can't make herself heard. Series for young children. Igglepiggle falls and gets mud on his tummy. Igglepiggle and Upsy Daisy ride in the Ninky Nonk and get muck over that too. In a magical forest, characters have adventures. The Pontipines count to five. Makka Pakka builds a pile of five stones. The Tombliboos are in their bush. Series for young children set in a magical forest. The Pinky Ponk gets stuck in a tree and tips up. Everybody slides up and down and the Pinky Ponk breaks free. Series for young children. The Pontipines set off for a walk around the garden. Mr and Mrs Pontipine lose the children. Which flowerpot are they hiding in? Series for young children set in a magical forest. The Pontipines count to six. Upsy Daisy shows Igglepiggle how to jump up and down, and everyone joins in. Children's animation. 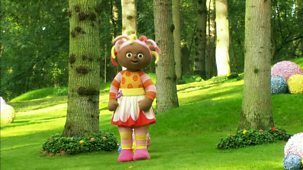 Makka Pakka is in the garden looking for stones but gets lost and worries that he will not be able to find his way back. Series for young children. The Tombliboos practise music so loudly it can be heard across the garden. The Pontipine children know how to stop it. Series for young children about a magical place. Igglepiggle has lost his blanket. Upsy Daisy helps him look for it. Series 1 - Who's Next On The Pinky Ponk? Series for young children. The Tombliboos ride the Pinky Ponk. They guess who will board next, but nobody notices the teeny-tiny Pontipines arrive. Series for young children. Mr and Mrs Pontipine find the children asleep in Upsy Daisy's bed, but only Upsy Daisy is allowed to sleep there. Series for young children about a magical place. Igglepiggle and Upsy Daisy visit Makka Pakka and discover a stone stuck in his trumpet. Series for young children. Makka Pakka visits the inhabitants of the garden to wash their faces. Everyone loves it - even the teeny tiny Pontipines. In a magical forest, colourful characters have adventures. The Tombliboos try to build a tall tower with their bricks but the ball keeps knocking it down. In a magical forest, colourful characters have adventures. Upsy Daisy is having a dancy day in the garden. Series 1 - Oh Look! It's The Wottingers! In a magical forest, colourful characters have adventures. The Wottingers call on the Pontipines, but there is no reply, so they go looking for them. 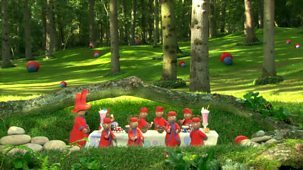 In a magical forest, colourful characters have adventures. Everyone rides on the Ninky Nonk except the Tombliboos, who ride in the Pinky Ponk instead. Children's animation. Igglepiggle and Upsy Daisy are best friends, but Igglepiggle can't find Upsy Daisy, so he looks everywhere and asks everyone. Everybody goes for a ride in the Ninky Nonk but Makka Pakka gets left behind. He chases the Ninky Nonk as he wants to give the Ninky Nonk a wash.